as well as broad clawed feet and flat top make the Hasegawa Tripod Ladder incredibly safe and easy to use. Similar to the design of the Eiffel Tower, your weight is directed downwards and outwards, pinning the ladder to the ground. The back leg adjusts quickly and easily up to 2′ in 6″ stops with a spring-loaded pin. Extending 6″ and shortening 18″ for use on slopes and uneven terrain. 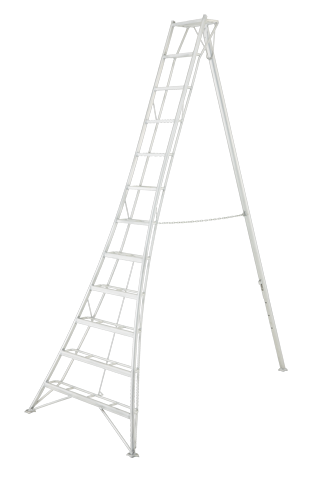 The ladders are welded, extruded aluminum construction, weatherproof, strong and very light. Double rungs are easy on the feet, and resist getting muddy or slippery. All GSC models come with 3 hard surface rubber safety feet. The GSC model is available in sizes from 6′ to 16′ feet. All ladders are 300lbs. capacity. All ladders are Type 1A ANSI approved.